The sweet sounds of Torah permeated the halls of Young Israel of Woodmere over the last several weeks, as the YIW Post-Kaylie Summer Kollel was in full swing. Every day, from Sunday through Friday, more than 40 motivated boys gathered to learn an energetic morning seder under the tutelage of Rosh Kollel Rav Yosef Nusbacher. Following davening and breakfast, Rav Nusbacher delivered daily shiurim on sugyot in Arvei Pesachim, which were followed by scrumptious lunches and basketball intramurals in the YIW gym. The kollel members returned at nights as well, to partake in a dynamic night seder program. Rav Shay Schachter, Rosh Bais Medrash at YIW, gave the kollel a number of engaging shiurim, as did numerous guest rabbonim, including Rav Mayer Twersky, Rav Daniel Feldman, Rav Aryeh Lebowitz, Rav Shalom Axelrod, Rav David Fohrman, and Rav Yoni Levin. Additionally, the kollel had a guest morning shiur from Rav Michael Rosensweig, Rosh Yeshiva at Yeshiva University. 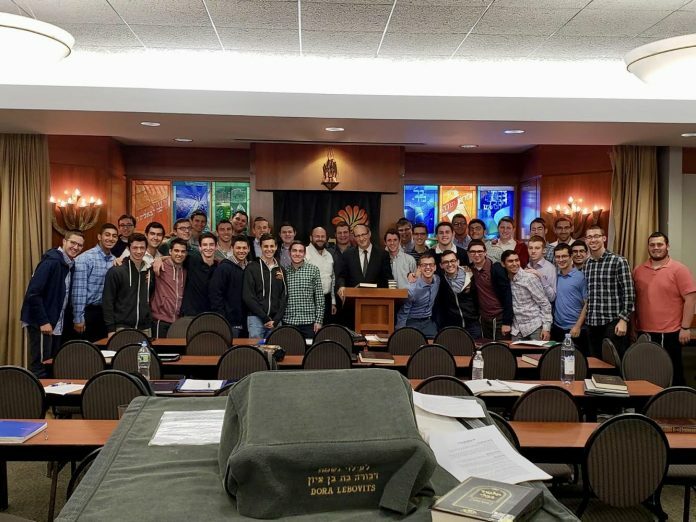 “The fact that so many serious Talmidei Chachamim were willing to take from their precious time to share Torah with us served as a testament to the value and importance of our kollel,” said Benyamin Bortz, a member of the kollel and incoming Shana Aleph student at Yeshivat Sha’alvim. A father-son breakfast and morning of learning, as well as a lavish concluding banquet, closed the kollel on a tremendous high. Members walked away with commemorative sweatshirts, but more importantly, with a wealth of Torah knowledge to jumpstart their journeys in yeshiva.